When my husband works at home, as he's been doing this week, he usually joins me in a cup of tea about 3:00 in the afternoon. I tease him that his English ancestry is calling, because he seems to look forward to that tea break with rather un-American enthusiasm. This isn't the first time in our relationship that Jim and I have enjoyed a regular tea time. When we were dating, we often ended our dates with a cup of tea and a plate of Keebler chocolate fudge cookies. At the age of 17, my culinary skills were nonexistent limited, but I could brew a mean pot of Tetley tea. 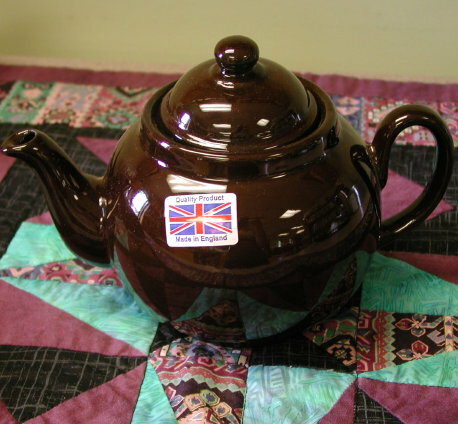 I had even bought us an authentic English Brown Betty teapot to brew it in. When we first got married, we switched over to after-dinner coffee. In the summer of 1976, Mr. Coffee's were brand new (amazing, right?) and it was so easy and fun to make coffee, that we'd brew up a pot each evening about 7:30 or 8:00 and sit down to watch TV. In those days, Jim left for work at an ungodly early hour, and I usually didn't get up to drink coffee with him. Like much of the rest of American, we've become addicted to the PBS series, Downton Abbey, and I always smile at the way the British invest tea with ever miraculous powers. A nice hot cuppa seems to cure everything from broken hearts to wartime injuries. Although I don't know how powerful our afternoon tea breaks are, it's nice to stop working for a few moments and refresh yourself. How about you? Do you and your partner count on any rituals to make the day more pleasant?